The air is getting chilly and it is time for cozy comfort food. This Fall Breakfast Hash Recipe will get you going in the morning! 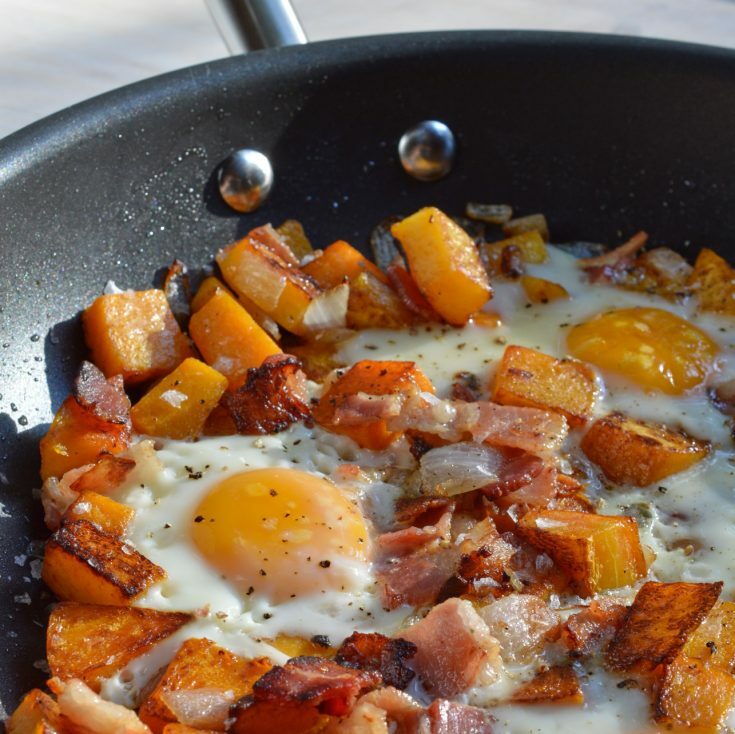 It is an easy breakfast recipe made with butternut squash, bacon, onions and eggs. Use compliant bacon for Whole30, Paleo. I am an Egg-bassador for The Happy Egg Co. 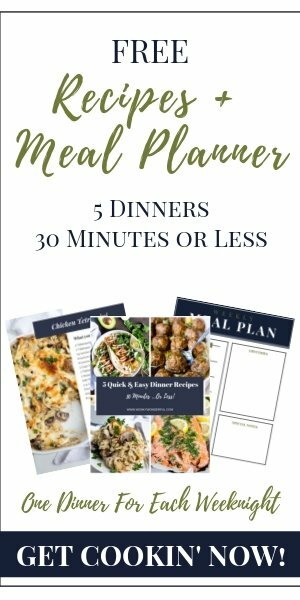 I am proud to be partnering with them to bring you this tasty recipe. I will always go for a savory breakfast over sweets. . . unless we are talking about donuts. But, other than donuts I am a savory breakfast gal all the way! This Fall Breakfast Hash Recipe is my idea of heaven. It is super easy to make, take just 4 ingredients, fills you up and tastes amazing! 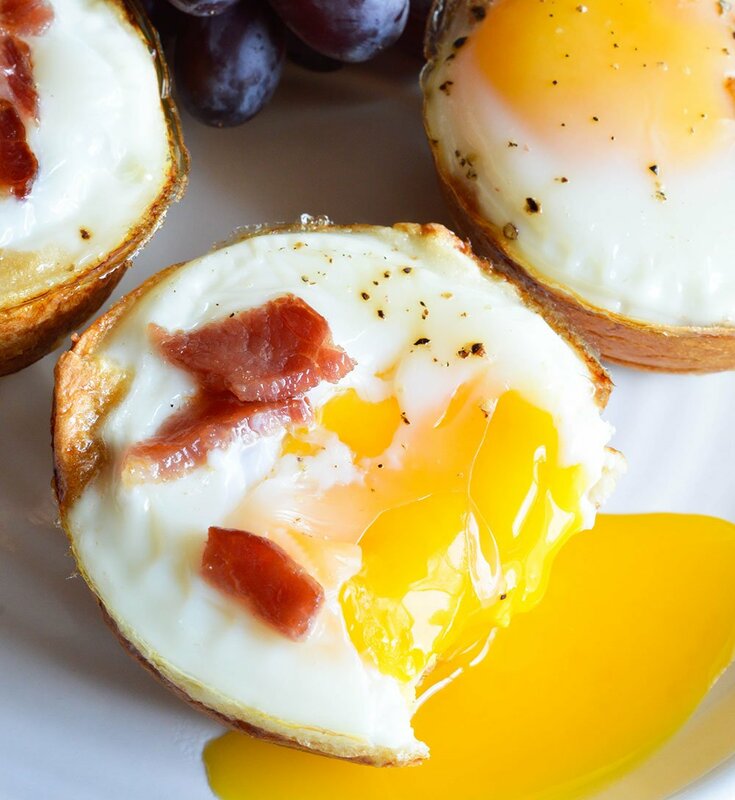 I make this breakfast recipe even easier with precut butternut squash. 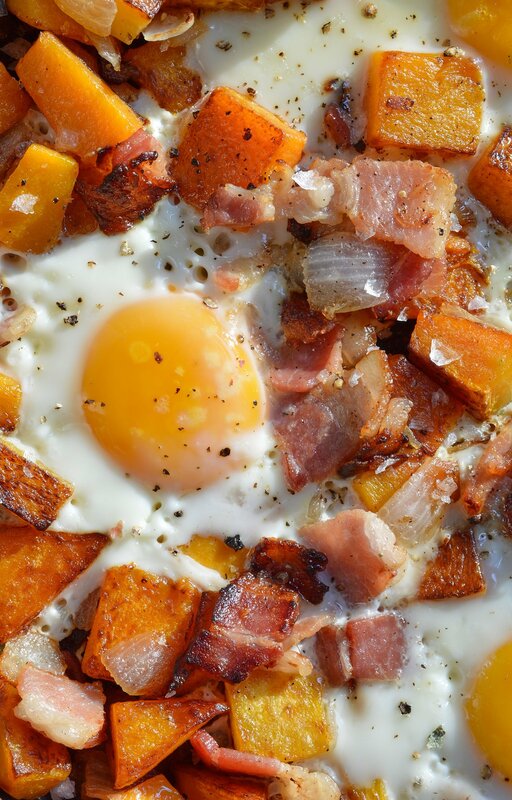 While the butternut squash and sweet onions are fantastic, the bacon and eggs are the stars. Bacon is kind of always a star and the fried eggs with the runny yolks are perfection. The yolk acts as a sauce for this dish. 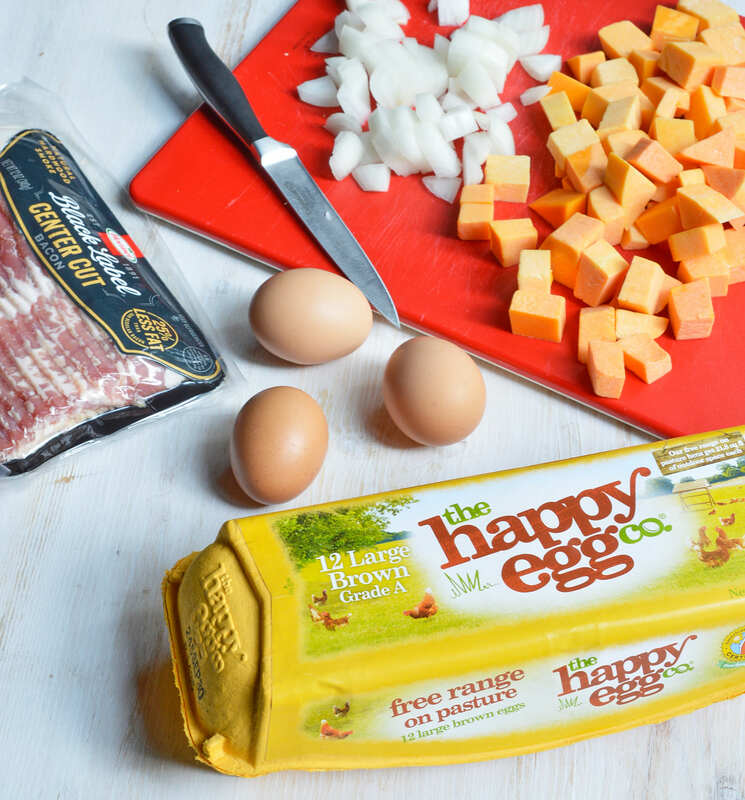 I have been a fan of The Happy Egg Co. for quite some time. If I’m being totally honest it was the happy yellow packaging that first drew my attention like a bright shining sun peaking through grey clouds. Once I tasted the eggs and learned a little about the company I was sold! The Happy Egg Co. eggs come from free range on pasture hens. That means these lucky hens get to spread their wings outside everyday. You would think that would be standard but unfortunately it is not. Caged eggs come from hens who live their entire lives in a wire cage while cage free eggs come from hens that are locked indoors their entire lives. Free range eggs come from hens are free to roam outside daily. In my personal opinion happy hens lay happy (tasty) eggs! Uhhh seriously, that egg though. 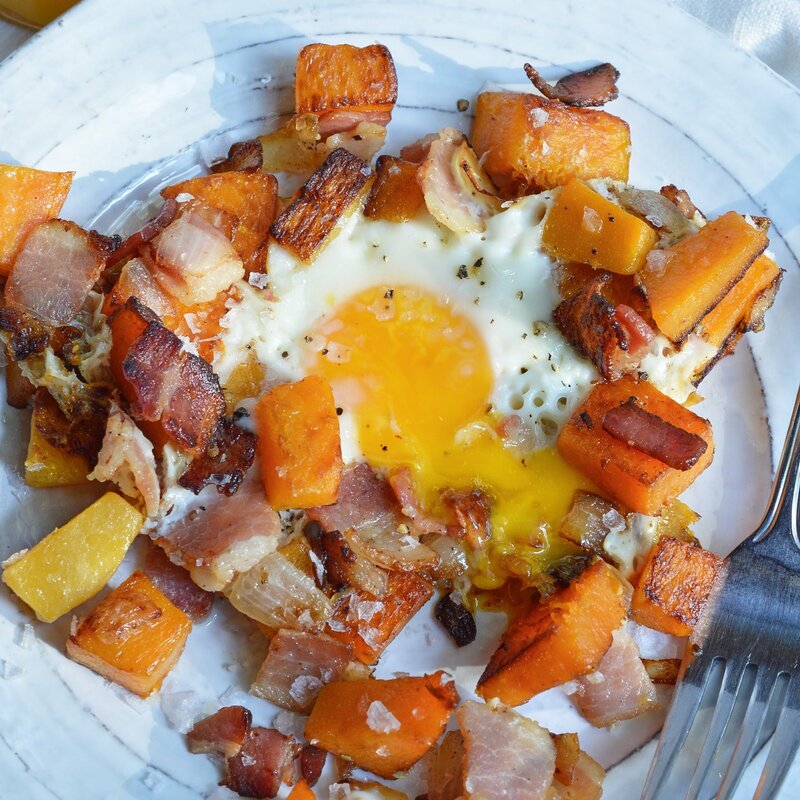 This Fall Breakfast Hash Recipe is absolutely dreamy! This hash, a hot cup of coffee, a snuggly robe and a cold morning. . . Perfection. This Fall Breakfast Hash Recipe will get you going in the morning! 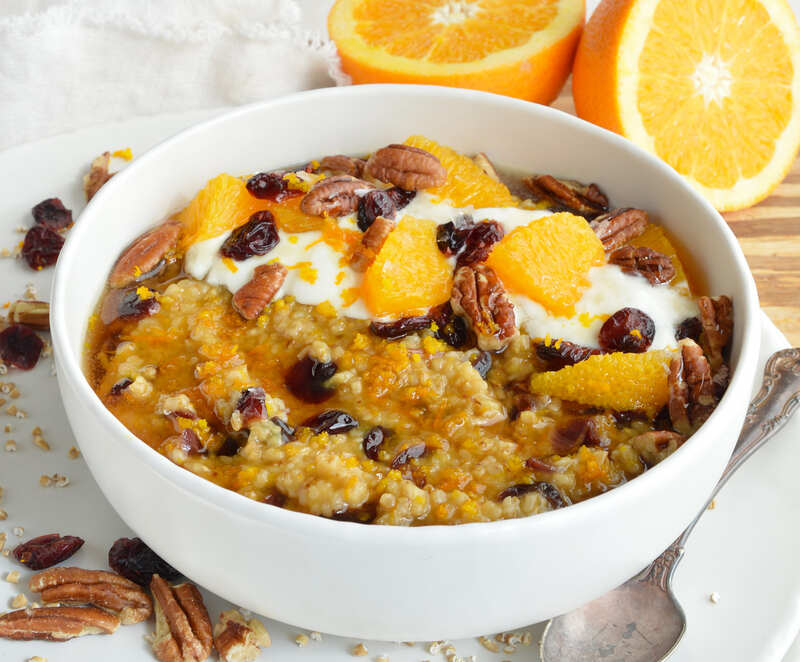 It is an easy breakfast recipe made with butternut squash, bacon, onions and eggs. In large skillet, cook bacon and onions over medium/high heat (stir occasionally) until bacon begins to crisp and onions are translucent.Remove from pan and set aside. Leave bacon grease in pan. Return the bacon and onions to the pan. Cook 5 more minutes. Make 4 spaces for the eggs. Crack and drop eggs in spaces then cover. Cook eggs to preference. Remove from heat. Salt and pepper to taste. Serve. More Breakfast To Get You Started. . . I just made this and used Apple Smoked Bacon – this is one of the best recipes I have ever found on Pinterest! Sharing with everyone I know!! It is raw. Just make sure the chunks aren’t too huge so they will be able to cook through.